Parts, tools and supplies for the electronics experimenter. 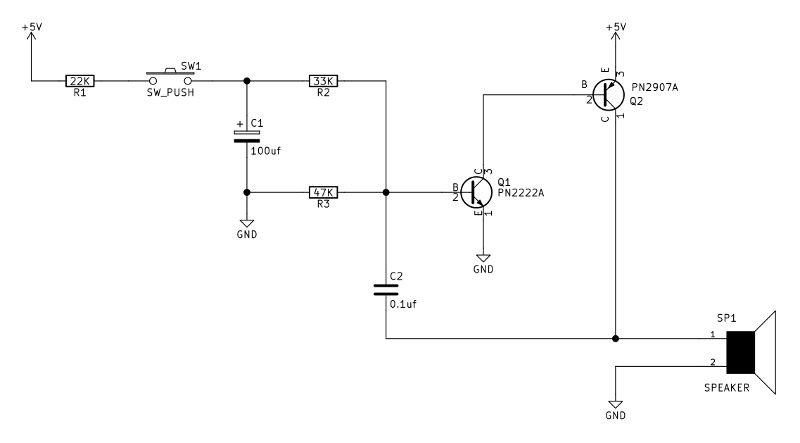 The Two Transistor Siren is a fun circuit that is easy to build. When the tactile push-button switch is pressed, the circuit produces a tone which steadily rises in pitch. When the button is released the tone gradually descends in pitch. Although the circuit is very simple, the effect is indeed quite reminiscent of an emergency siren. This circuit is an example of a relaxation oscillator which produces a tone in the audible range. Capacitor C2 (0.1uf) charges until it reaches the activation threshold of the PN2222A transistor and is then quickly discharged. The process repeats many times a second, driving the audible tone through the speaker. Capacitor C1 (100uf) creates a delay in the circuit and is responsible for the rising and falling of the pitch. When the switch is first pressed and C1 is in a discharged state, the voltage to C2 is low and the oscillation rate is corresponding low. As C1 charges, the voltage present at C2 rises and the oscillation rate increases. Eventually C1 is fully charged and the tone becomes stable. When the switch is released, C1 slowly discharges and the oscillation rate begins to decrease. Electrolytic capacitors are polarized and must be mounted in the proper orientation. On standard electrolytic capacitors the cathode (negative lead) is identified by a stripe on the package. Also, the cathode lead is typically shorter than the anode. The circuit was built and tested at 4.8 volts DC (4 AA NiMH rechargeable batteries). Any power source that supplies about 5v DC should work fine.